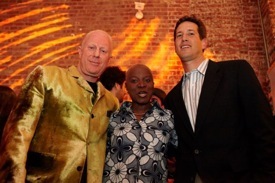 Bob Sager, Angelique Kidjo, and Bill Miles smile during the ESPN event in New York. On May 12, 2010, ESPN brought the global soccer community together at a private event to celebrate the 2010 FIFA World Cup and to raise funds for GRS. The event showcased 32 murals, commissioned by ESPN in promotion of the 2010 World Cup, and painted by a collection of Cape Town artists in South African graffiti style. The murals will appear in publications and on subway platforms and billboards in New York, Los Angeles, Chicago, and elsewhere from now through mid-July. Featuring a performance by Grammy-award winner, Angelique Kidjo, the event raised over $25,000 for GRS’ HIV prevention programs in South Africa. The following article featured in Vanity Fair on May 14, 2010. Like many others, I’m worried about the long-term economic impact that the World Cup will have on South Africa. The country is spending an estimated $5 billion on the tournament—an investment that may quickly become a burden once the games are over. But thankfully some organizations, like Grassroot Soccer, have forgone complaints about how that money could have been better spent. Instead, they’re focused on using the World Cup as an opportunity for exposure.